This massive warship summons an entire army of frigates to overwhelm the enemy with the support of rapidly-replacing assault and repair drones. The on-board shield generator makes this Juggernaut difficult to kill, marking it as a truly terrifying opponent on the battlefield. In "Genesis," a new entity born of hubris and malice appears to threaten Post-humanity and Substrate alike. Juggernaut units and allies old enemies in order to take down the entity that threatens to tear the galaxy apart. a challenge - the AI has been improved so that it's no walk in the park! 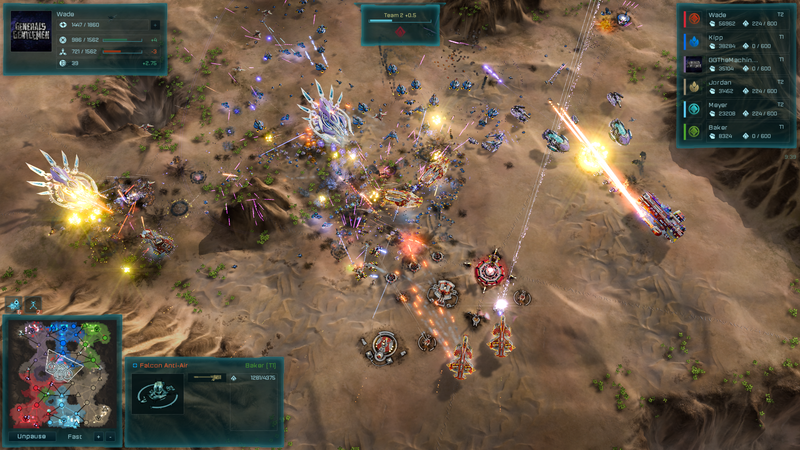 For more information on Ashes of the Singularity: Escalation, please visit www.ashesgame.com. We are excited to launch our new class of units: The Juggernauts. The Substrate Nest of the Queen and PHC Leonidas bring destruction to a whole new level; Juggernauts will be many times more powerful than Dreadnoughts and will be the ultimate late game weapon. Don't expect to see Juggernauts in your average match as their cost is substantial, but when a Juggernaut is fielded, serious firepower is needed to stop them in their tracks. Rather than being capped at level 5 like Dreadnoughts, Juggernauts can level up infinitely. Each time a Juggernaut ranks up, it automatically receives a 5% bonus to health and damage. Both are devastating against all ground targets, but can be countered with air units. The Leonidas is a heavy Dreadnought destroyer, boasting the most powerful weapon ever mounted on a construct. It can tear apart Dreadnoughts and has rail cannons and auto cannons for defense. 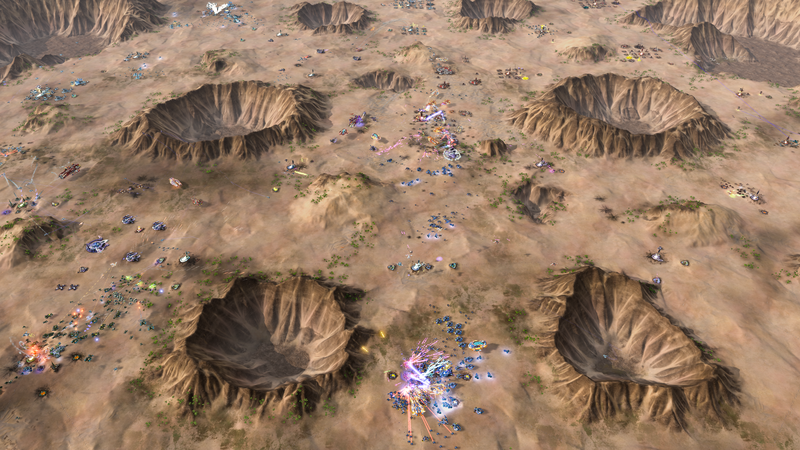 The Nest of the Queen summons an entire army of frigates to overwhelm the enemy with support of with assault drones, repair drones and a shield regenerator. Frigates and drones are rapidly replaced in combat, making the Queen truly terrifying to encounter. 2.3 comes with Episode 3 of the story-driven campaign which introduces the Leonidas and Nest of the Queen. Genesis features 6 new fully voiced missions in what will be our most challenging campaign to date, we’ve put a great deal of effort to make sure "Much Harder" is no walk in the park, even despite having access to the two new Juggernauts. 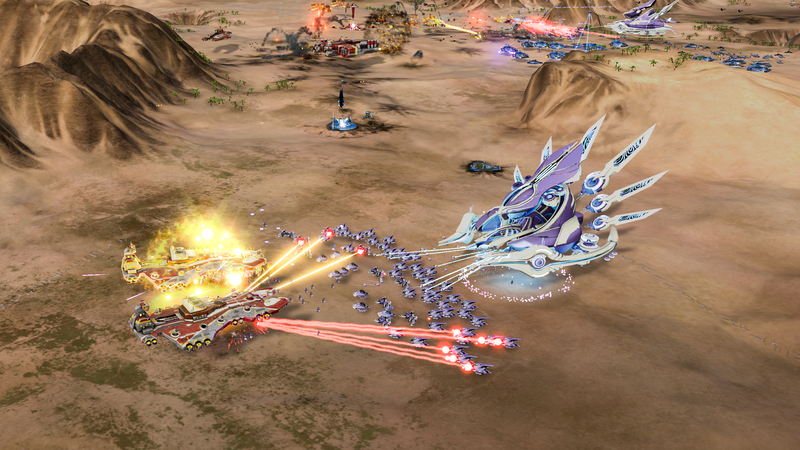 In preparation for the new Genesis campaign, the original campaigns have been adjusted to improve the user experience and update them for the additional units and buildings introduced in Escalation. 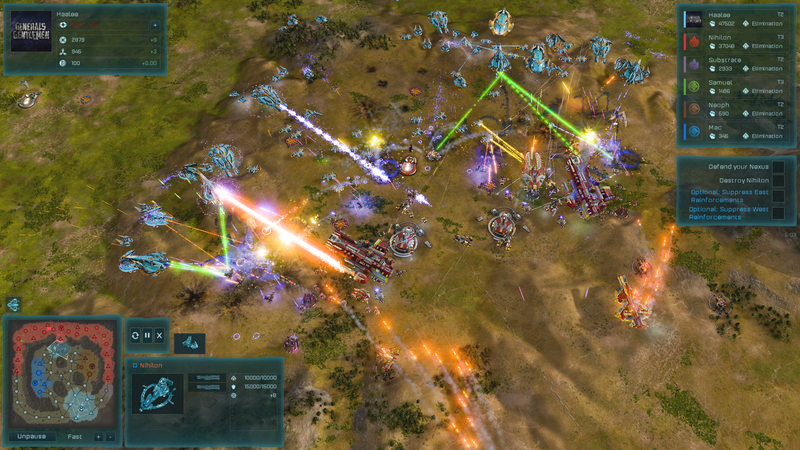 For most new players, Imminent Crisis will be their introduction to Ashes of the Singularity so we wanted to improve the first impressions. The changes done to these campaigns is far too extensive to list here, but you can view the full campaign changelog here. New Maps: Seginus, Mizar, Achernar, Lyra and Eltanin and added for free. Thanks to Luxlupus for his work on these! Ganymede had too little Radioactives which limited strategic diversity and unit flexibility. It also had a huge concentration of Metal in the corners which made the middle of the map less valuable and too pushing for a player who gets locked out of the corner. These changes will affect the Memories Campaign Mission. Seton was unfair for certain teams and players due to having access to different amounts of resources. Its pathways were also extremely narrow. We are adjusting it to make it fair for every player. Thanks to Luxlupus for his work updating Seton. Every player now has access to the same amount of resources. “Rush Build” now properly doubles resource drain in exchange for double production speed. Added menu option to re-enable right-click form armies. 2.25 update has put balance and strategic diversity in a nice spot, and as a result balance changes was only a small focus for 2.3. The following balance changes are aimed at tweaking some of the under performing and over performing outliers. The Eradicator’s inability to target buildings was contrived and unnecessary given the huge tech requirements, cost and slow movement speed. We are allowing the Eradicator to target buildings to make it more flexible. The Drone Hive was overshadowing the Avenger against Frigates. Now the Avenger is much cheaper and faster. There was no reason for the Sapper to be as painfully slow as it was.Sapper movement speed and acceleration increased to match the Engineer. Dreadnoughts were the only PHC units to have an energy bar, yet only their special abilities required it. This was misleading as their main weapons didn’t require energy to fire, and created problems when Dreadnoughts ran out of energy since PHC have no tool to replenish it. We are removing the energy from PHC Dreadnoughts as it is unnecessary since the abilities already have long cooldowns. The auto cannons on the PHC Dreadnought were under performing as they only had 300 range, which often was not enough to get within range of their targets. We are increasing the range of auto cannons so they can better contribute and make Dreadnoughts less vulnerable to mass Frigates. We are lowering the time it takes for The Overmind to replenish its Drones to make it perform more consistently and make it better perform compared to the Drone Hive. The Savager had far too little shields at only 40% of the health, which could be frustrating as Substrate have no way to repair health. Giving the Savager more shields also improves the bonus that the Shield Regeneration upgrade provides. The Shredder turret was over performing and is losing damage and life time on its Drones to compensate. The Sentinel and Oblivion turrets are supposed to be the long range defenses, it didn't make sense for the Barrager to have as much range as it did. 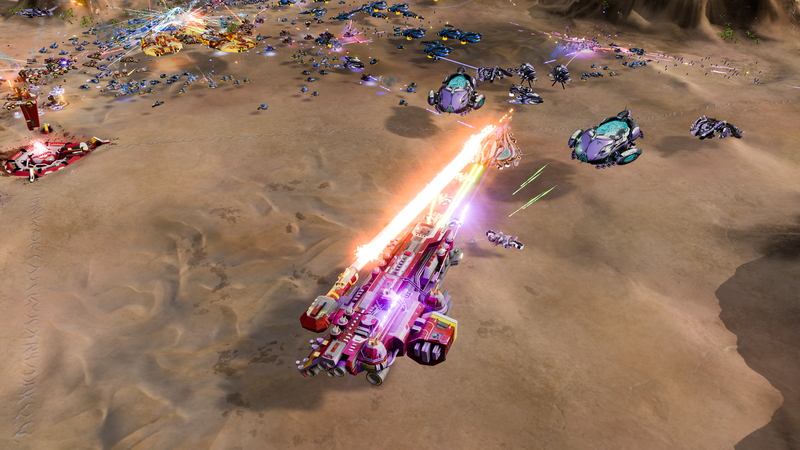 We are removing the air attack from the Smarty and Barrager for mostly cosmetics reasons. Air units have much higher health pools than ground units, so the air damage on a Smarty was negligible, serving only to obscure where the real damage sources were coming from. This clouded the visual clarity, especially since Constables and Smarties used the same rocket projectile. There are plenty of methods to counter air units, Smarties and Barragers attacking air units is just superfluous. Shields replenished per burst increased from 15 to 45. The repair bay was too cheap for how potent it was in synergy with other defenses, especially as how it could repair itself so easily. Sweet! Going to try it out this weekend. TX for the great work. What can i say... Great work by stardock! Just replayed first campaign, it is on a decent level now. Keep up the good work guys, you still got my respect! P.s. i really enjoyed how you present content now via video.